This is a wonderful memory, thank you Laura, thank Lisa, and no staff and friends. It’s wonderful to know you, thank everyone who helped us on this journey. friendly staff, good atmosphere, free dinner every night, thanks the Malaysia guy made the special dinner for me. highly Recommend! 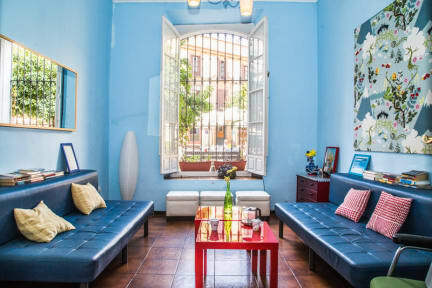 located 3minutes walk from metropol parasol. Everybody would have a great "Interview' with Joanna one by one, nice girl will show u the rules and what they will offer like group dinner and free walk etc. Clean and stable IKEA bed, room and bathroom is a little small but is OK for me. Strong ac makes u feel safe to get to sleep, "Bigly" recommend. Awesome place with lovely guys! really nice hostel, especially the free dinner party, highly recommend!